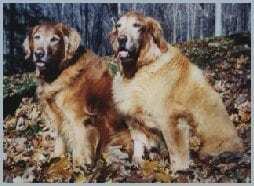 Terrific Twosomes - Yankee Golden Retriever Rescue, Inc.
From time to time, owners surrender not one, but two Goldens to YGRR for placement. Once the dogs have completed their veterinary examinations and arrived at Riverview, our professional staff sets about evaluating whether it is in the dogs’ best interest to remain together. Each decision is made by analyzing the dynamic between the dogs and whether the dogs can live happily without each other. Fortunately, dogs are not sentimental. They live in the “here and now,” so we can easily see their attachment or lack of it. We keep dogs together who “can’t live” without each other — no matter how long it takes. An example of this commitment was BJ and Kelly, the senior/special needs couple who stayed with YGRR for nine months until we were able to place them together. YGRR’s ability to keep pairs together is made possible by support from our members and friends and the willingness of adopters to take two dogs at one time. Here are some examples of Golden pairs of different ages that have been placed together — coincidentally all with previous YGRR adopters. Abbey (age two) and Jameson (age one) were surrendered to YGRR because their owner traveled frequently, leaving the dogs alone often. They had lived together for a year and probably could have been separated, but during the same week that they were admitted, we received a request for two young dogs. By Abbey (left) and Jameson (right) as told to Tom and Kathy S.
We wanted to write to let you know that we are both doing very well and love our new home! We have a big yard (with a fence) and get lots of exercise chasing each other around and around. I (Jameson) love to explore all around the house and yard. I am very intrigued by the chipmunks that live under the hot tub on our patio and fish in the big fishpond in our yard. I have not learned, however, that the fishpond is just for looking at, NOT for swimming! The yard here has so many interesting smells! Inside we have lots of toys because two other dogs (Molson, YGRR #1450, and Rosie, the December 2002 YGRR calendar dogs) lived here for a long time. I am not really interested in tennis balls, unless Abbey has one, then I want hers. I have a new bigger ball that I like and there are some nylabones around if I feel like chewing on something. We are eating well and getting dog treats to practice our good behavior. When the weather is nice, Tom takes us for a long walk in the reservation. I am trying to be patient and not pull too much on my leash, but I can’t let Abbey get ahead of me! At night, we each have a nice bed with a big cushion up in Tom and Kathy’s bedroom and we try not to wake them up before 6:00 a.m. I (Abbey) am happy that Jameson and I could stay together, even though he likes to steal toys from me. We really like to play together and are happy to have each other for company when Tom and Kathy go out for a while. When I first got here I was a little nervous in the back yard. I was afraid to go too far to explore as I thought there might be one of those invisible fences around somewhere (like in our last house). After the first week or so, I figured out that this place didn’t have one and now I can run all around the yard! I am still pretty timid and frightened by a few things like the vacuum cleaner or any loud noises. Also, when someone says “No” I get worried and a little anxious, although it’s usually Jameson getting into something he’s not supposed to! I love playing catch with my tennis balls, but when we’re all done playing, Tom puts them away so I don’t chew the covers off! I am getting a little braver when Jameson steals one of my toys. I will sometimes steal it back and even tease him a little to make sure he knows I have it! That’s all the news! We miss all of you at YGRR but are happy to report that we both got official new tags with our name, address, and phone number so I guess it’s safe to say that this will be our home for a long, long time! Sonny and Frito were also given up by an owner who traveled frequently — leaving the dogs alone for long periods of time. At YGRR, the six-year-old littermates immediately made it clear that they could not be separated. If one was taken out of the kennel without the other, the dog left behind howled until his brother returned. Fortunately, we were able to find them a home together. by Bruce and Sally S.
Adopting two dogs at once was not anything we had ever thought about doing until the day before we did it. However, Emma could have not picked a more perfect moment to call us and ask if we would consider adopting two dogs because, when she called, we wanted a dog pretty badly. We lost our beloved Dustin, age 12 (YGRR #879) just after Christmas last year and were hoping to have another dog before the holidays this year. After we lost Dustin, we held off for a while before putting in a new adoption application. We thought if we waited, it might turn out that we didn’t want another dog after all. With no children at home and no dog, we were true empty nesters for the first time. We thought we might begin to like our freedom and not want to give it up again. We let a few months go by. It turned out that the pain of not having a dog was stronger than the pleasures of freedom, and as time went by, we wanted a dog more, not less. We had always enjoyed early morning fall and winter walks with Dustin, and as October was coming to an end, we were beginning to miss these daily walks more and more. So when Emma called about the two dogs, we thought it over for a bit, considering whether we could give two dogs enough attention, whether we were prepared for twice as many vet bills, twice as much hair, twice as much poop, and twice as many dog parts to trip over. The dogs were in our house within twenty-four hours of Emma’s call. We have found that two lively, healthy dogs are more work than one quiet dog who lived with life-long after effects of heartworm disease, but we are enjoying it. The house would be incredibly empty without them. We can understand why it was a good idea to keep them together. They are quite a matched set. They have different personalities and habits, but they are also so much alike that watching them is like watching synchronized swimming in the Olympics. Or having double vision. They tend to walk shoulder to shoulder, as if they are in an invisible harness. They react the same way to the same sounds, cocking their heads simultaneously. They sniff together at the same things outside. They back up together, too, if they need to. They look at us with exactly the same expressions. It’s a hoot. They each answer to their own names, sort of, but both come to “Where’s your brother?” Two dogs at the door provide an overwhelmingly friendly greeting. These brothers treat each other quite well. Human brothers could take heed. They are absolutely not jealous of each other. They are not possessive about food, toys, or attention. They are friendly, happy, outgoing dogs and seem to love each other, all people, and all other dogs. They have obviously had very good care. (It speaks well of their other family to give up dogs they thought they couldn’t care for correctly, rather than neglecting them. It must have been a very difficult decision.) Sonny (right), the more gentle dog, takes care of Frito (left) and washes his ears as a greeting if the dogs have been apart. They have very energetic play fights outside, usually initiated by Sonny. We let them do this because we figure they have probably been doing it for six years and know what they are doing. Frito is bigger and stronger, but he doesn’t use this strength to hurt his brother. They seem to enjoy themselves greatly and are very agile. Being a two dog family is completely new to us, and we are all still learning. There have been surprises and some adjustments. Most of the surprises have been good ones, and all of the adjustments would have occurred whether we had one dog, two, or three. Two dogs cooperating can get into more mischief than one, but most of our “adjustments and adaptations” have centered on Frito, who is a little livelier than his brother and is heavier and stronger too. It stands to reason that a dog named for a snack would be adept at getting into food. So far Frito has scored hamburger rolls from the bread box, a whole freshly baked warm pumpkin bread from pretty far back on the kitchen shelf, and papers from every waste basket he can stick his nose in. The moment the dogs walked into the house for the first time, they found a little edge of plastic sticking out of the bread drawer and managed to get the drawer open. We have been a little slow on the uptake about this, because Dustin was a dog with an overdeveloped conscience. He wouldn’t get into the rubbish if his favorite food was visible right on the top. These dogs are not like that and probably won’t ever be. We base this conclusion on the pumpkin bread incident. We were in the living room and heard the commotion in the kitchen. We yelled at Frito to stop. Instead of stopping, we could hear him try to speed up, knowing we would be arriving from the other room. It seems that it will be easier to train ourselves to be more careful than it will be to train a dog named for a snack food not to graze for unattended food. We do intend to do obedience training with them though. Sonny doesn’t need it, but Frito sometimes pulls on the leash and doesn’t always come if he’s called. They are so bright and agile that they should do well. And they are doing pretty well at training us to be a two dog family. These girls lost their home when their owner became ill and had to move to no-dogs-allowed housing. As with Frito and Sonny, Estee and Cedes could not be separated. Their attachment to one another was obvious and intense. The challenge for YGRR was to find someone willing to adopt a senior and a young dog together. I moved from England to the U.S. ten years ago. My dream was to own a house, a piece of land, and two dogs. Of course I said yes. Nikki, YGRR #1308, and Casey, YGRR #1307, came into my life in March 1994. The first night they came home I thought to myself, “What have I done?” Gradually I came to realise that I had done the right thing. What if I had only been able to take one? They might have been separated. As time went by, I saw how dedicated to each other these two dogs were. I can imagine that it is not often that a family can take two dogs together, but I have seen how important it is for some dogs. When you are away or out, they keep each other company, they feed off each other, and with such different personalities, they help each other through life. Eighteen months ago, Casey passed away in his sleep without any warning. I was hysterical for weeks, but I still had Nikki and she helped me get through one of the most difficult times in my life. Then later, Nikki developed a cancerous tumour and had to have her front leg removed. After weeks of chemo, she seemed to be doing well, but the cancer came back and I had to have her put to sleep. My two best friends in the world were gone. My world was so empty. The house was tidy and clean, but there was no one to welcome me when I came home. I decided that I just had to adopt two new dogs. Again two — I feel it is so important that if there are two dogs that need homes that must stay together, if you can do it, it is worth the extra everything. I completed an application to adopt again and told YGRR I wanted a pair. I now have Estee (right) who is four and Cedes (left) who is nine. Unfortunately, their previous owner developed cancer and had to give them up. Once again, what if YGRR could only find separate homes for them? They have always been together and I feel so lucky that I have been able to give them both a home and keep them together. I realise that not everybody can give a home to two dogs, and anyone who can give even one rescue dog a good home is doing something wonderful. For those who can take two dogs together, I urge you to do this. It is so rewarding to see how happy they are together that the extra work, expense, etc. are more than worthwhile. Double the bills, double the worry, BUT double the joys, affection, and love! They take care of themselves and only need the love that you can give them. I feel so very lucky to have had Casey and Nikki and now Estee and Cedes in my life, which would have been very empty without them. 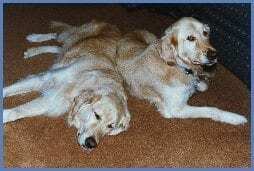 Two senior Golden girls were surrendered to YGRR because their family lacked the time and wherewithal to continue to keep them. At YGRR, Cayman (age 8) and Molly (age 9) demonstrated great affection for and dependence on one another so we knew they had to stay together. We are very fortunate to have a loyal group of adopters for senior Goldens. Even better is the fact that some “senior adopters” are willing to take senior pairs. As I write this, I am looking at a screen saver made from photographs of our first two YGRR adoptees, Toby and Leah. 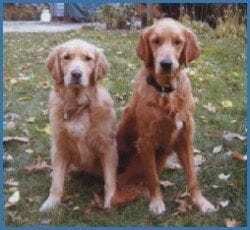 We had raised two Goldens from puppyhood, and having lost them fairly recently, we were seeking to adopt. This time we wanted seniors, and our vet had told us about YGRR. We lost no time in applying. Anyway, when the call came, YGRR asked if we would consider adopting two dogs. We gulped, but then went on to listen to the story. 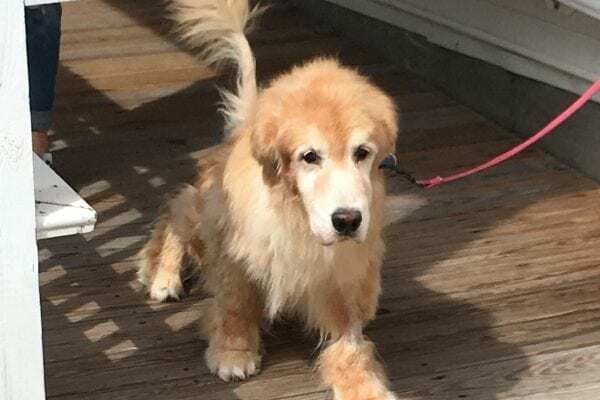 Toby had been a stud dog for a “puppy mill,” and when his owner no longer had the females, Toby, at age 9, was of no further use to him. His owner asked his vet to put Toby down, but the vet got his consent to transfer him to YGRR. Toby, YGRR #1173, arrived in a neglected if not abused condition, and was understandably depressed. This is where the love affair began. Leah, YGRR #1065, who at age eight had been returned to YGRR because her first adopter had to enter a residence facility that didn’t allow pets, took Toby under her wing and got him out of his depression. YGRR did not want to separate them. When we met them in July 1993, it was almost love at first sight. Leah was a fat (105 lbs.) but happy girl, and Toby was an energetic and handsome guy. We swallowed our gulp, and said yes, we would take both. The fact that they were each in the company of a familiar soul made their adjustment process unusually easy. We were very lucky: we had them for six years, rather unusual for Golden seniors, and until the end, they enjoyed quite good health. Toby was incontinent for the last year or so of his life (which posed its own set of challenges), but since he showed no sign that he wasn’t still enjoying life, we kept him going as much for Leah’s sake as for our own. Toby finally died of a brain tumor, and Leah only lasted another four months or so before giving up the ghost – I still believe that upon losing Toby, she lost the heart and will to go on. There was nothing major wrong with her health, even at her advanced age. Well, we really didn’t expect to repeat this experience, but this last summer it happened again. 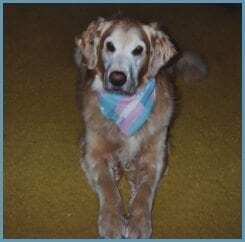 We had recently lost two other Goldens (one of them McCain, the subject another Golden Times article) to cancer of the spleen, both suddenly. We had applied for our third round of YGRR adoption (we were looking for seniors again), and when we received a call from Emma at YGRR inquiring whether we would consider adopting two dogs again, the wonderful first experience made our decision very easy. So now we have Molly and Cayman to join our Buddy (a Golden Retriever/shelty mix, not a YGRR dog). This has been another happy story. No one can believe that their previous owners wanted to give them up. They are not only good looking gals, but also have the gentlest manner about them (except, of course, when getting dog biscuits!). They are still attached to each other, and sometimes share their pads. Being together has definitely eased their adjustment. They are getting on well with Buddy, and are clearly very comfortable here. We had another spleenal cancer scare with Molly, but this time that part of the story had a happy ending. Molly (right) is home, alive, well, feisty, and happy (although minus a spleen), and Cayman (left) is looking after her. There is no reason why we can’t have them for a good while yet. To anyone considering adopting a pair of dogs that have a pre-existing relationship, I can only recommend it. Not only does the pre-existing relationship give them something familiar to ease the adjustment process, but you, as we, will enjoy watching the relationship in action. The relationship between dogs and their owners is wonderful enough, but when they have a relationship with each other as well, the experience is even more exciting. 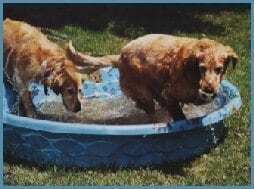 YGRR will not separate a devoted pair of Rescue Goldens for reasons of convenience or expediency. If two dogs need each other, we will keep them until adopters like Bruce and Sally, Kathy and Tom, Frank and Freddy, or Liz come along. However, in some instances, although a pair of dogs might have lived together a long time, after serious consideration YGRR will separate them if it is the best interests of both dogs. With some pairs of dogs, one pushes the other around to excess and makes the subordinate dog’s life miserable. In other cases, the dogs get along all right but are not attached to one another particularly. In situations such as these where the dogs will be happy and in new homes much faster apart than together, we place them separately. Sunshine #1728 and Rusty #1727 were littermates originally surrendered to YGRR in 1995 at age four. Since their puppyhood they had been kept in a pen during the day and in the garage at night. Because they spent so much time together, they bonded with each other and not their owner, who was absent most of the time. At YGRR, if one dog was separated from the other they would become very upset, so we decided to place them together. Four years later, the renamed dogs were returned to YGRR when their adopter became terminally ill. At YGRR, our staff observed that Kasha, the female, pushed Kylee around constantly. Kylee displayed the body language of a dog under siege whenever Kasha was around. But if he was given the opportunity to spend time alone with a staff member or a dog other than Kasha, he emerged from his shell and exhibited a much happier demeanor. Similarly, Kasha seemed more relaxed when she didn’t have Kylee to boss around. She was most contented when she had the attention of a human all to herself. So the decision was made to separate the two dogs and find each of them a home where they could be the center of attention. Kasha (shown here getting ready for Scottish Dance class) came into my life at the end of August 2001. 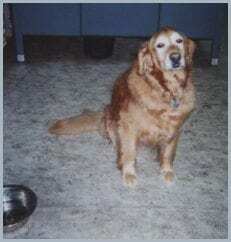 She is my third Rescue Golden, replacing Maggie, YGRR #3219, who replaced Goldie, YGRR #1055. At the age of nine when she arrived, Kasha was a “girl with a past,” and although gentle and loving, she didn’t have much obedience training. Now she’s fairly reliable when told to sit, lie down, stay, come, etc. At the age of almost 10 1/2 (I like to say “going on 3”) she is wonderfully lively and can run like a gazelle. As the proverbial “stomach on legs,” she will eat anything that remotely resembles food and (ugh) some things that don’t. She is a talented food stealer. I have learned to be sure food is either high up or in the center of a wide table. 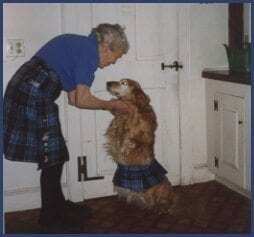 Thursday evening is Scottish Country Dance class, where she joyfully greets everyone. She doesn’t dance much (two left feet) but she “intermissions” very well! Walking around our town, as we do daily, I’m known by my dog: if she’s not with me (on my way to church) strangers will ask, “Where’s your dog?” She loves trips to the bank; she gathers a lot of interest (and cookies), but never makes a deposit. Kasha is a wonderful, loving companion who comes up to me when I’m sewing (my business) and sticks her nose under my arm. She lights up my life! Rusty came into my life on November 28, 2001. 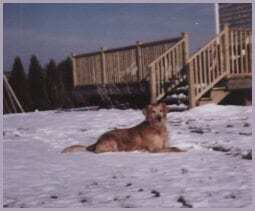 Rusty will be ten on February 19, 2003 but in spirit and energy, he is going on two. He is a love — sweet and friendly. He hasn’t met a person or dog he doesn’t like. In his first nine years, he never was walked on a lead and to this day his manners on lead leave a lot to be desired, even after a session at obedience school. He was the oldest student at school, all the others were young pups, but Rusty was the brightest with a great desire to please. He was the teacher’s pet. At the time that I adopted Rusty, I was told he was insecure and he is, and probably always will be, but he has so many other qualities that it is okay. Rusty shares his home with five cats, all of whom love him and one in particular – Amber the Siamese – curls up and sleeps with him to keep warm. He goes to work with me and has the run of the office. The office is rather laid back, neighborhood dogs are welcome to spend the day with us, or come in for a short time, a biscuit, and drink of water. We offer “doggie day care” and have a Golden by the name of Annie. She has her own bed, as does Rusty, but Rusty can usually be found snuggling up on her bed. We consider Rusty our “senior editor” at the publishing company. I think you can tell we all think he is special. Most dog owners think their dogs are the smartest and brightest, but mine is! We expected that these two eight-year-old littermates might have to be placed together, because they had lived as a pair their entire lives. But at YGRR, we were surprised to observe that they were both very confident, whether together or apart. In the absence of one, the other did not pine at all. Each dog enjoyed the company of other dogs, as well as each other. (If you did not know the history, you would never guess that they both came from the same home.) This, together with the fact that Kingston required hip surgery with a three month recuperation, led to the decision to place the dogs separately. Both are doing very well in their new homes. Magnum (YGRR #1334) was the first in 1994. He was a large, red boy, happy, protective, and loving. When my husband Bill became ill in 1995 and fell down on our living room floor, Magnum lay down gently beside him with his head on Bill’s chest and stayed with him until help arrived. I know many other Golden owners could share their own stories of the Golden’s special love and loyalty. Magnum gave me five more years of his friendship after Bill’s home-going and I still miss him. In August of 2000, another large, red-haired boy came into my life. Bogie (YGRR #2900) a 9 1/2 year old senior citizen. He had spent a large part of his life, with another Golden, tied on a runner for about 9 hours a day. When turned in, he was found to have heartworm disease, and had been treated for this. He was laid-back, sweet, loving, and gentle. At bedtime, his favorite place was the living room couch. About the same time each evening, he would “step up” onto it and go to sleep. He would, however, never fail to lift his head and with tail thumping, greet me no matter how often I’d walk into this area. Bogie had excellent health for two years, but very suddenly became sick. (Our home had some months prior changed to a three-generation family, which included my son Steve, daughter-in-law Jen, 8-year-old grandson Tim, and their feisty chocolate lab Coco.) Naturally, we were all saddened by sweet Bogie’s passing. I will always miss this loyal friend. We all missed Bogie. When I contacted YGRR this summer to see if they would “keep their eyes open” for another boy to fill the empty space in our hearts, I found that the adoption search would have to be for a dog with a background showing compatibility with children and other dogs. We anxiously waited for the “right dog” to appear and then heard from Allyson regarding Bailey, YGRR #3552. On August 31st of this year, all five of us went to Riverview for the scheduled appointment and Bailey bounded into our lives! Bailey, also a senior citizen, is 8-years-old, golden color, and smaller than my first two. (He is so soft that he reminds me of a Gund puppy.) He greeted me and then happily played ball with Tim, met Coco in the outside enclosure, and also Jen and Steve. It was unanimous that we all wanted Bailey to come home with us and it seemed he felt the same. Arriving home, he fit in immediately. Bailey had been turned in with another Golden and it was obvious from the start that he had not been the alpha dog. Frisky Coco still holds that position and Bailey takes his cues from her. She even has him “talking” as they run with bones, etc. in their mouths greeting Jen as she comes home from work. Bailey has even run with two socks hanging out of his mouth which resembles fangs! Tim loves to lie on the rug with Bailey as his pillow. And me? As I write this, he is lying at my feet. He loves to run on the beach with Coco (both proudly walking side by side). They will even eat from the same dish! I think Steve summed it up best one night when Bailey had been with us a few days. He called him to come. Bailey jumped on the love seat into Steve’s lap and rolled himself over to lay in Steve’s arms. Steve laughed and said, “Who couldn’t love this dog?” AND WE DO!!! by Christine, Ian and Benjamin M.
As I write this it’s been nearly three weeks since Kingston came to live with us. His first impression was climbing into the back of my Volvo wagon upon the most luxurious dog bed (it’s so large I could use it as a guest bed for a medium size child). It was a good thing I brought it along because as soon as we accessed Route 495 we came upon bumper to bumper traffic, which we remained in for nearly 40 minutes. Due to the fact that Kingston had hip surgery barely three months earlier, I’m sure that lying on a hard surface for that long would have been uncomfortable. Add to that the additional hour of driving still ahead of us and we would have had a very sore dog upon arrival. Needless to say, he had fully bonded with his new bed when we did finally get home. I would say it took him about 24 hours to acclimate and figure us out. We drag his bed upstairs at night and back down in the morning (he trots right behind it to see where they are going). Also, he is learning all about the Invisible Fence. He has done extremely well, however I still walk with him along the perimeter of the yard to make sure his boundaries are reinforced. We have a little over a half acre, which provides him with lots of space for ball throwing and sniffing gardens etc. Kingston needs to work his leg more to strengthen it and reduce the atrophy due to his surgery. We do throw the ball but only once or twice because when he runs, he picks up his favored leg and takes off on the remaining three. When walking slowly and climbing stairs, he will use the leg. We are hoping he’ll be as close to good as new by the spring. In a nutshell, he is an instant hit for our family as well as friends and neighbors. He has such a sweet personality and his energy level is still that of a dog several years younger. There is no doubt that he is the perfect match for our family. Thanks again! YGRR’s option of keeping pairs together, when it’s best for the dogs, is made possible by you, our loyal members and friends. At YGRR, “the dogs are the clients” and we thank you for helping us serve them. If you have two dogs, be aware that when they play, they might inadvertently harm each other. Collars can present a grave danger for dogs who wrestle because one dog’s teeth can become caught in the other dog’s collar. If the collar tightens, the dog can be strangled. Buckle collars may become too tight too remove if wedged in a dog’s jaw — use breakaway collars which can be quickly and easily removed.If two dogs swim together, make sure that one doesn’t clamber on top of the other and force it under water for long periods of time, which can lead to drowning.